Let us look at this news story that is more than three years old and comes to us from NPR on a story on how Holywood gets fed. In the old days, craft service didn’t deal with food at all, because there was no free food service on the studio sets. Actors simply brought their own food in brown bags, and there was a break for lunch. Previously I discussed a real simple yet powerful variation of Ansoff Growth Matrix – one that is fitted to look at customers and customer jobs instead of markets and products. Customer jobs in its essence is a customer need (utilitarian or hedonistic) and customers buy products (or hire them) to fulfill those needs. 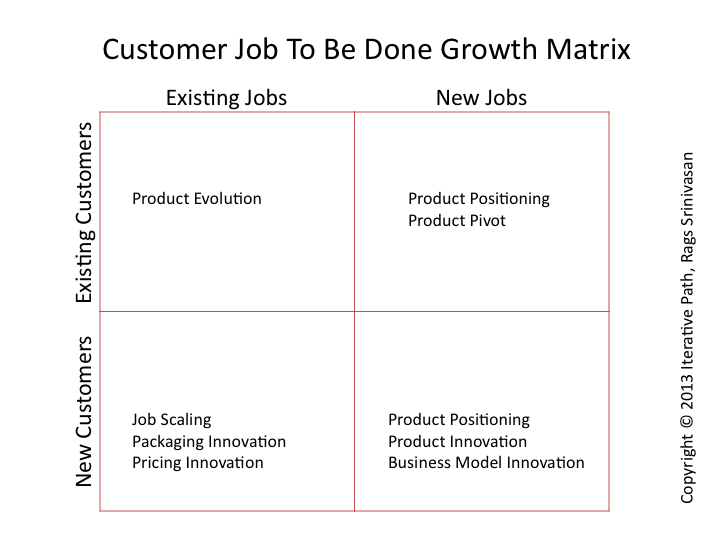 Here is how the growth matrix looks like with customers and jobs. Any business that is either trying to break in (startup) or trying to expand (enterprises) has four paths based on this matrix and related actions that go with those options. One of the options is: Serving new jobs of customers you already have (that is jobs you did not serve in top left quadrant). When customers already hire your products for certain jobs you have an incredible opportunity to understand rest of their jobs and identify those that you could serve with simple product pivot. You can’t go after every job. Strategy is about making choices. Your choice has to be based on opportunity size, your cost to fill that job better than what customers hire to do the job and your likelihood of success. In the case of Craft Service featured in the NPR story their customers originally had hired them for different job. The new job of feeding the production crew did not exist or had alternatives (brown-bagging). A change in environment created this new job that needed addressing. It is likely Craft Service did not actively make a strategic decision to take on food service. But they did their current job so well that their customers sought them out to fill new jobs. As managing food service fit within the realm of what Craft Service was doing it was a right product pivot. While Craft Service got lucky, if we want to take this path to grow our business we must be constantly engaging with our customers to surface new jobs that our offerings would serve better than current alternatives while making a profit for us. Sometimes better product positioning would suffice, other times product pivots are required. How do you find the jobs your customers hiring products for? ← Not everything that counts can be counted … but did you try?